Kickstarter accessory opens Sonos up to Bluetooth use | What Hi-Fi? One of the minor criticisms we have of the Sonos line of products is its lack of both Bluetooth support and physical connections. 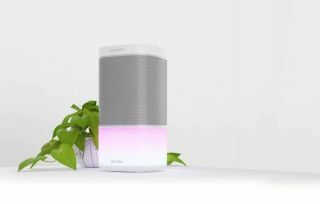 While products such as the Play:1, Play:3 and Play:5 wireless speakers can easily play music over wi-fi, if your internet connection is unreliable or your player doesn't use wi-fi, you're out of luck. That's where a new Kickstarter-funded accessory called Darlite comes in. Acting as a connected base for a Play:1, or as a middle-man between any other Sonos product and your router (via an ethernet connection), the Darlite has Bluetooth, DNLA and a 3.5mm input jack. The music is then streamed, through Sonos' own mesh network, to your other Sonos products. But that's not the only feather in Darlite's cap: connecting to it means that phones or operating systems that don't support Sonos' app (we're looking at you, Windows Phone) can still be used. And while Sonos requires you to have a 'premium' subscription to many streaming services - such as Spotify - with Darlite you don't have to, and can also use apps not supported by Sonos with your speaker set-up. YouTube, Audible and BBC iPlayer, are all playable through Darlite. Though the app IFTTT ('IF This, Then That'), which allows you to create chains of simple commands using multiple apps, you can also get visual feedback whenever you receive a tweet or Facebook message. Darlite has multi-coloured LEDs in it, so will flash whenever something comes through. It's an impressive idea, but with the announcement of AirPlay 2 - which can connect speakers from multiple brands together - it has its work cut out. Pledging €120 (approximately £100) will secure you a Darlite, with shipping estimated for January 2018.